We ran out of excuses, the Kochman family is now a member of the local YMCA. Step #2 is to use the membership and we did that today. 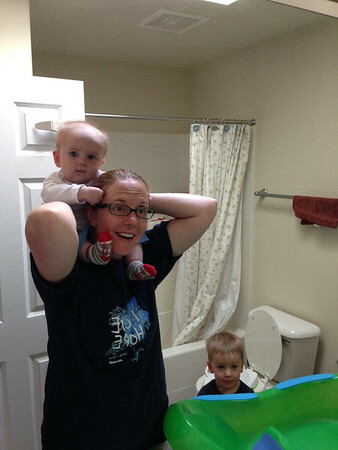 We timed it for the boys to go to childcare while I went to a group fitness class. Reading the childcare handouts they suggest trying it for a few minutes at a time to let the kids warm up to the idea of being watched at the gym. I opted for the “talk it up big and put them in their for an hour+” strategy. Lucky for me it worked in my favor. Cooper had no tears despite some other kids screaming as they were being dropped off. I told him “Mama was going to get big and strong while he played” and he repeated this many times on the way there and home. Nicholas was tear free initially, but when I stepped out of the class to check on them I could hear his cry from down the hallway. I checked in and they said he was really tired and they would come get me if he didn’t calm down. When I came back at the end of class both boys were smiling. Looks like this will be a great addition to our weekly routine, especially as fall approaches.